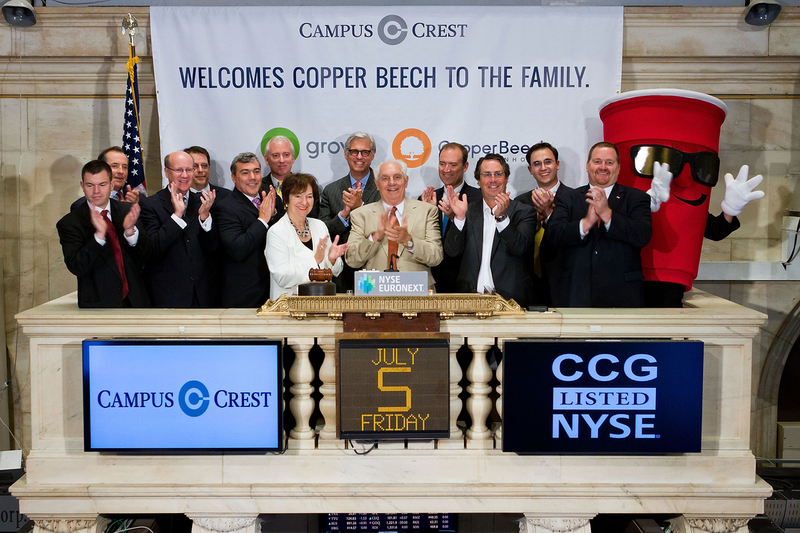 On Friday, July 5th representatives from Campus Crest Communities (NYSE:CCG) and its operating partner, Copper Beech Townhome Communities, visited the NYSE and ring The Opening Bell®. Campus Crest develops, builds, owns and operates student housing communities that make a positive impact on the world. It all began with a unique vision: to create a vertically-integrated platform that could develop the best student housing properties in the industry. The Company believed it could make a difference in college students’ lives by delivering a resident-focused, service-enriched experience they couldn’t find anywhere else. Since 2004, Campus Crest, led by CEO Ted Rollins, has risen to the top of the student housing industry because of its value-driven, vertically integrated platform and hospitality brand approach. Currently, Campus Crest’s student housing properties operate under two brands, The Grove® and Copper Beech. Its portfolio consists of 84 communities in proximity to college campuses located throughout the U.S. With more than 44,000 beds, Campus Crest is the second largest public student housing platform. The Company continues to grow organically by delivering new properties each academic year.